The perfect place for a family that needs togetherness as well as time to themselves. 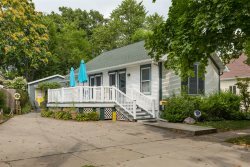 This house offers lovely views of Lake Michigan and a newly remodeled back yard dining/garden area. Inside the house, you will find two family rooms; one with a flat screen television, the other with a fireplace. Spend an afternoon getting lost in the pages of your favorite novel on the screened porch complete with wicker furniture. Enjoy preparing a meal and being able to dine with the whole family in one place. Please Note: Water levels and beach conditions change on a regular basis. Some days there is not much beach and some days there is quite a bit of beach. Some days you will find a large amount of rocks and some days there is more sand than rocks. However, everyday you can enjoy the beautiful views from this house. The epitome of total customer care...warm, responsive and professional. Imagine heaven...with a panoramic screened-in front porch! Very friendly. Took care of any problems as soon as possible. Even changing houses. Loved it. Flowers were even in bloom around house. There is nothing better than hearing your family laughing together, dining together and playing together. This property, and it's screened in porch and lovely backyard, made us feel at home. There is more than enough room for everyone - including a back room where you could curl up with a good book.